Nothing is more comforting in winter than roasting some freshly made sausages in the oven with potatoes or slicing bite size pieces, pan roasting, and serving with a glass of wine. Using some freshly made sausage when making a pot of sugo (sauce) for pasta can make a sunday plate of home made tagliatelle even more special. There are many different types of salamis and each region of Italy follows their particular family recipe, often a secret not shared. One rule that is consistent with any region, is the amount of salt needed to preserve the meat, and that should be 30 grams of salt per kg of meat. This will ensure that the salamis and sausages cure well and do not spoil. 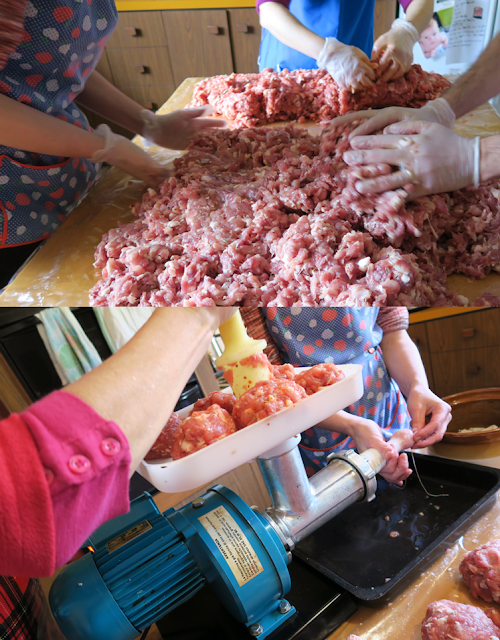 Sausage making in our family follows two recipes past down from our grandparents and slightly modified to suit varied tastes. One is a Calabrese recipe and the other is Siciliano or a version of. I'm not too sure if I agree with the first part of this proverb, but I do know that in our family we make enough salami to last us the whole year quite happily. My maternal grandfather nonno Rocco was Calabrese and their traditional recipe distinctly uses moscato (muscat) wine, hot chilli paste or powder, home made red capsicum paste and fennel seeds which give the salami their distinct colour and flavour. My grandfather although Calabrian, married and spent a majority of his life in Montemurro a small town in Basilicata, the south of Italy. Sausage making in Montemurro was, and perhaps still is an old ritual that starts with the slaughter of the pig, and ends with using all parts of the animal including the blood. No part of the animal is wasted. I wrote about this in one of my previous posts Sanguinacchio Dolce - A bloody good desert. Here you will also find a link that takes you to Montemurro in the 60's and shows the ritual linked to Carnevale. My mamma's version of this recipe uses moscato, hot chilli flakes, fennel seeds & her home made capsicum sauce. This freshly made capsicum passata was used to make 10kg of Calabrese sausage this year. The rest was made the Siciliano way. This recipe uses fennel seeds, chilli flakes (quantities to taste and depending who is in charge) and moscato wine to flavour the meat. Lots of chilli...no, less!!! The amount of chilli is often argued over and sibling rivalry requires mediation...well, until backs are turned and in goes more chilli! All hands on deck are required as it is a coordinated effort that can last all day and evening. Often friends come over to lend a hand, or put in their order and assist in the learning process. This year we were spared the task of cleaning the casings/bungs which happens the day before and quite a gruesome experience that no one wants...we opted for the artificial ones. Yes, convenience has a way of changing traditional methods, but the end result is just as good. The whole process of making salumi is done in the kitchen at my in laws. My husband is the man in charge to tie and hang the sausages, which ends the day by hanging them at our place in the garage for approximately 4-6 weeks, depending on how cold it is. This end process needs monitoring as moisture or heat can cause the whole batch to go off. This is why the chosen spot in the garage is never changed and repeatedly provides us favourable results. It also allows my husband to proudly visit them every morning when leaving for work. Another successful year of sausage making. Did I mention that capocollo has also been added to the repertoire? There are three hanging in the garage that my sister in law has begun learning to make. 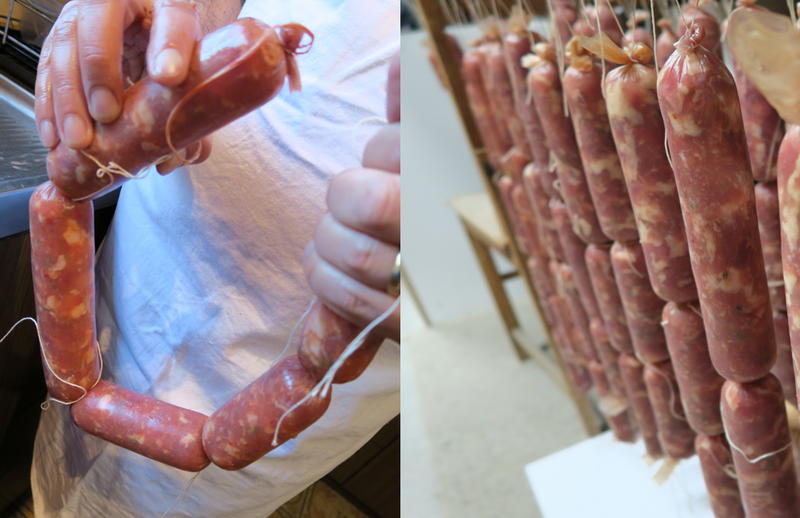 Soon we can start our own salumi making classes! What do you think?